Think of a lie – double it – add a pinch of fibbing and a teaspoon of invention. Stir in a handful of clueless adults and a seemingly bonkers classmate, then sit back and wait for the pizza to rise. Danny Quinn isn't exactly lying when he announces that his sister has been reincarnated as a dog. No-one believes him though, so he is sent to The Liars' and Fibbers' Academy where he just learns to tell whoppers more convincingly. Aided by a girl who insists she's a mermaid named Derek, and Inigus Jowly, the school's mysterious caretaker, Danny is able to hoodwink his family until he finally learns the truth. But this turns out to be more outrageous than any fib he could come up with. 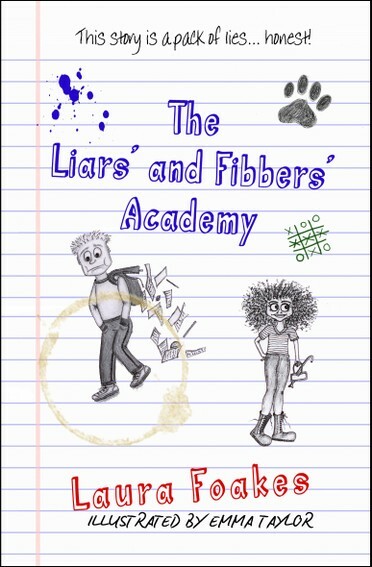 The Liars' and Fibbers' Academy is a funny and quirky children's book. It will appeal to fans of David Walliams, Roald Dahl and Francesca Simon. For readers aged 9+ or perfect to be read aloud to younger children. Click here to visit the official Liars' and Fibbers' Academy website. "When Danny Quinn truthfully tells everyone that a stray dog is the reincarnation of his older sister, his mother takes to her bed. Danny is sent to the Liars and Fibbers Academy where he meets Derek, who insists she's a mermaid. They are the only children at the school, which has no teachers. This is a wonderfully quirky read, which has lots of humour and depth. There is a great cast of characters such as Danny's granny, Lydia who does head standing yoga and belly dancing, and Miss Balalaika from Petersburg who lives upstairs with her Arthur (arthritis), eats Chum dog food, and looks out for Danny with her cries of 'Oi Vey'. The narrative rattles along, diving into Inigus' past as a mud lark and turd collector for a tannery in Victorian England. There is wit and originality in the writing which swooshes the reader from past to present and then into a further dimension. Underlying the fast paced action is the unfurling story of two children struggling to cope with bereavement and with the guil they carry from feeling they were responsible for their loved ones' deaths. Passionate about literature, Laura took inspiration for The Liars' and Fibbers' Academy from her own childhood. Embracing her younger self, and the level of creativity that comes with the younger imagination, she teaches that sometimes, it's OK to have fun. Click on the image below to find Laura on Author Hotline.